Week ending 23rd November 2018. 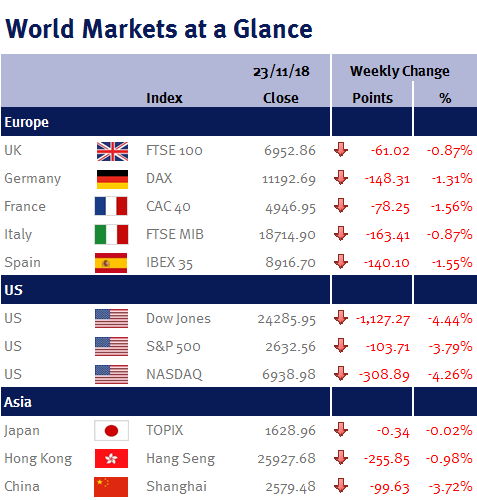 Following Mike Pence’s (the US Vice President) comments at last weekend’s APEC summit, talk of a new cold trade war between the US and China dominated equity market sentiment – and as a result, the below table of equity market moves makes for ugly reading as most equity markets sold-off again this week. However, while Mike Pence’s comments would on the face of it suggest that the US-China trade issues won’t be resolved anytime soon, personally, I don’t think we should read too much into it as it was essentially the same message that he has previously delivered, which doesn’t suggest to me that there is any widening of the divide. Consequently, I am still hopeful that Donald Trump and his Chinese counterpart, Xi Jinping, will be able to make progress towards a resolution when they meet during the G20 meeting in Argentina at the end of next week – and given equity markets have already priced in all the bad news, this could quickly turn into a positive if the recent market weakness helps knock heads together and the US and China agree a trade deal. And let’s face it, Donald Trump could declare a victory simply if China agrees to strengthen IP protection for US companies and import more US products. For example, simply redirecting orders from Airbus to Boeing would make a big difference. Airbus announced almost 200 orders from Chinese buyers at the Farnborough Airshow in July – and Boeing believes that China will buy 7,690 new planes worth $1.2 trillion over the next two decades and that China will account for 18% of the world’s commercial aeroplane fleet by 2037. Also adding to this week’s wall of worry were reports that Apple has cut production orders for all three new iPhone models. As a result, Apple’s shares ended the week at $172.29 – over 25% lower than their all-time high on Wednesday 3 October 2018. Sometimes bad news can be good news and this week we saw that confidence among US homebuilders fell by the most since 2014. This underscores the deteriorating outlook for the housing market as higher interest rates reduces demand – and a housing decline could lower US employment and slow both consumption and GDP. In addition, the price of Brent crude oil fell below $60 (its lowest level since last October 2017), which will help curb inflation, after Donald Trump refused to take action against Saudi Arabia for the murder of Jamal Khashoggi. Consequently, this will hopefully persuade US Fed policymakers not to stick with their stated trajectory for interest rate increases (one more next month followed by another three in 2019). In fact, there were some dovish coos from the Fed this week from both the Fed Chair and Vice Chair, Jay Powell and Richard Clarida – so while the Fed is likely to increase interest rates in December, hopefully next year’s interest rate trajectory will finally (and thankfully) start to wilt. This will also help support equities, which have simply got too pessimistic about the outlook. This coming week we have the Fed’s preferred inflation gauge, the PCE and the second reading of US Q3 GDP, along with the eurozone’s CPI and unemployment data.